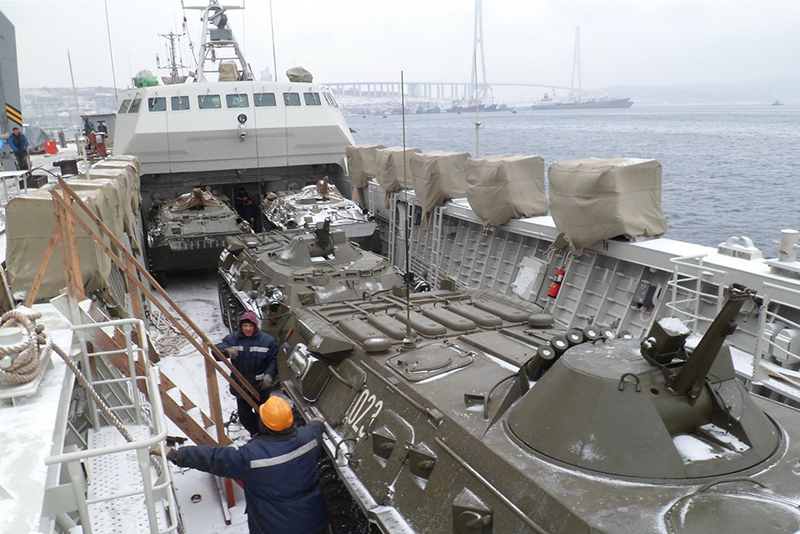 The Zubr air cushion landing craft is the largest in service and can carry three MBTs. Two craft were built by the Feodosiya Shipbuilding Company in Ukraine for the PRC and delivered in 2013 and 2014. 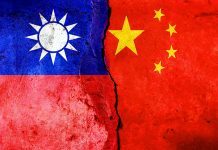 An additional two were to be built in China. However, in August 2017 a fifth craft was reportedly seen in construction. The development of ship-to-shore landing vessels means more volume arriving per trip at higher speed. The amphibious operation is considered by many military analysts and historians as the most difficult naval expeditionary operation. Its objective is to transition forces and their supporting vehicles and logistics from the sea to the land. As early efforts to move troops and supplies from ships to the beach using existing boats proved inadequate, it increasingly became clear that specially designed craft would be essential if amphibious operations were to be reliably executed. By the mid-1930s landing craft designs were being introduced by forces of the Japanese, the Soviets, the British and the US Marine Corps (USMC). These solutions were very similar and even drawing from each other. Each used a relatively flat bottom with the engine and most weight aft. This lowered draft forward facilitating beaching the craft. A powerful engine allowed the craft to back off the beach. Most used a propeller drive located in a ‘tunnel’ to protect it from damage in shallow water. The Royal Navy (RN), however, did field prototypes of a simple water jet propulsion design by Samuel Wright. A feature that was also widely adopted was the bow ramp. Seen on the Japanese 14 metre Daihatsu-class landing craft used from 1937 to 1945, the benefits were quickly recognised by other military observers. 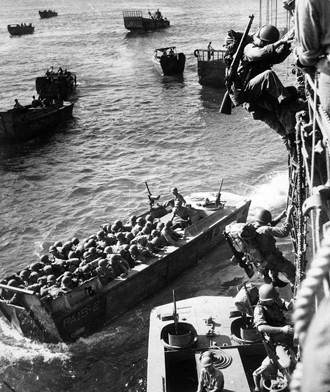 The USMC encouraged Andrews Higgins to include such a ramp on his landing craft design that they were acquiring. His Landing Craft Vehicle & Personnel (LCVP) became the most widely used craft of its type with over 23,300 produced and fielded. General Dwight D. Eisenhower, Supreme Allied Commander in World War II, stated that the LCVP “won the war”. It also contributed to establishing the amphibious landing as a viable operation. Landing operations from the sea have traditionally been defined by two distinct phases, the assault followed by the build-up of forces ashore. The assault is intended to make an initial lodgement on land and to secure a beachhead. For militaries with an established Marine force this assault is often conducted using armoured amphibious vehicles. These are specifically designed to swim from ships to the beach and then either disembark infantry to secure the beach area or to proceed inland as combat vehicles. The BAE Systems AAV7 tracked amphibious assault vehicle, IVECO SuperAV wheeled armoured amphibious vehicle and Russian wheeled BTR 80 have filled this role. Just as the LCVP landing craft, these assault vehicles are primarily infantry carriers. Bringing armoured vehicles, particularly tanks, and artillery ashore is accomplished by bigger landing craft (LC): the LCM- Medium, LCU – Utility and, since the 1980s Air Cushion Craft. These are intended to transit to the beach, drop their ramp, off-load and then return to their mother ship to repeat the task. Their objective is to build-up forces as quickly as possible to support the push inland. These were then followed by larger Landing Ships (LS) that would beach and off-load their content of various combat, logistics and support vehicles, as well as, supplies directly onto the beach. The LS are capable of open ocean sailing but have a hull and bow configuration that permits them to approach the water’s edge. They have large bow doors or a ramp for vehicles to disembark. Once off-loaded they back off the beach and return to sea. The flat-bottomed World War II LST (Landing Ship Tank) is the most renowned of this type. The term Landing Ship encompasses vessels as large as the 8,500 ton displacement Newport Class to the Polish 843 ton Polnocny-class ships. The Newports have a distinctive over-the-bow ramp as well as a stern gate that allows launch of AAVs. It remains in service with nine navies including those of Malaysia, Australian and the Republic of China. The Polnocny, which is classified as a ‘medium’ landing ship, is also widely deployed with eight navies including those of Russia, Vietnam and India. Each of these assets directly supports the viability of the amphibious landing in their own specialised way. However, a strong case can be made that it is the landing craft’s capability that is the key to the success of an extended amphibious operation. It also is the most suited for a range of other tasks such as disaster and humanitarian relief. Their low draft, open vehicle/cargo area and forward ramp make them ideal for not only for littoral areas but for use on inland waterways and rivers. It is, therefore, useful to explore them, their capabilities and contribution to expeditionary operations. The LCVP was based on boats designed to operate in the bayous of US Gulf ar-ea. This plywood constructed craft became the most widely fielded landing craft and served in every theatre in World War II. The basic configuration used in the LCVP and Daihatsu-class continues to be reflected even today in most landing craft that have been developed. Most have a central payload area with a forward ramp, a relatively flat bottom, and traditional propulsion system. They have grown in size drawing on the Landing Craft Tank (LCT) also used in World War II with the ability to carry not just troops but trucks and armoured vehicles as well. The LCM-8 (Landing Craft Medium) is typical of this traditional design and is used by the US Navy and Army, as well as by forces in Australia, Laos, Cambodia, Vietnam, Thailand and India. With a capacity of 54,360kg and a top speed of 12 knots (17km/h) they are also widely employed off-shore and on large river ways. The US is pursuing a replacement for the LCM. In 2017 the US Army awarded a contract to Vigor Shipyards in Portland Oregon valued at $979.8 million for the Manoeuvre Support Vessel (Light) (MSV (L). This 30 meter vessel will be faster at 18 knots (33 km/h) and have a greater payload including the heavier M1A2 Abrams main battle tank (MBT). 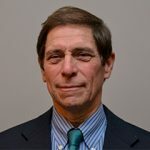 A Vigor statement noted: “Our MSV (L) design was developed in partnership with BMT following a detailed study of the Army’s unique needs and the available design options. The tri-bow monohull is an innovative yet deceptively simple design that provides superior manoeuvrability and stability in high sea states, through the littorals and within inland waterways.” The contract calls for one prototype vessel, four vessels in low rate production and up to thirty two additional vessels by 2027. The first MSV(L) is scheduled for delivery in 2019. The Spanish firm Navantia has also developed and sold its own LCM design. The LCM-1E uses water jet propulsion and has a capacity to carry a Main Battle Tank (MBT) or six trucks or 170 troops. With a 22 knots (41 km/h) maximum speed it is one of the fastest landing craft. Loading can be achieved through either the forward and stern ramp, which also assists craft to transfer loads from one craft to another. An analysis provided by Navantia demonstrated that the LMC-1E could move more loads to the beach faster than traditional LCM designs. Even transiting 20nm per trip from ship to beach the 1E could complete twice as many round trips in less time as the LCM-8. It has been acquired by Spain, Italy, Australia, and Turkey. Navantia’s LCM-1E uses water jet propulsion and a full deck design that facilitates loading and off-loading, as well as providing faster ship-to-shore turn-around time. One LCM-1E can complete the same tasks that would require two or more LCM-8s and do so more quickly. The latter two navies are fielding them in conjunction with their Landing Helicopter Dock (LCD) ships that are based on Spain’s Juan Carlos I multi-purpose amphibious assault ship. This ship, as well as many of the latest amphibious ships, has a ‘well deck’, a feature that has significantly expanded the ability to deploy landing craft more widely and in far distant operations. The well deck can be flooded and accessed by landing craft through an aft door or ramp. This allows craft to be transported in the ship and then floated so that they can exit under their own power. The well deck also facilitates the faster reloading of landing craft allowing them to return to the beach with additional loads more rapidly. Moving larger loads and particularly multiple vehicles falls to the Landing Craft Utility (LCU) and similar larger craft. The United States LCUs include the 1466, 1610 and 1627 classes some of which have been in service for 40 years. They share a configuration with the coxswain’s station on the starboard (right) side allowing a full aft to bow load area and straight passage between. They have a capacity of between 127,000 -183,000kg meaning they can carry up to two MBTs. The US Army, however, utilises the Runnymede class large landing craft or LCU 2000 class which has a large aft superstructure. It is classified as an open ocean vessel with up to 10,000km range and 18 days endurance. It also can carry up to 226,800kg which is equivalent to 5 M1 MBTs or 24 ISO containers. Russia’s Dyugon Class LCU is well suited to the transport of troops and armoured vehicles in the Baltic, Caspian, and Black Seas. Its air cavity hull design allows speeds of up to 35 knots. Here BTR wheeled armoured vehicles are transported . In April 2018 the US navy awarded a contract to Swiftships for the design and construction of its new LCU1700. A Naval Sea Systems Command (NAVSEA) spokesperson indicated that “the new LCU 1700 class will be approximately 139ft (42.4m) long with a beam of 31ft (9.4m) and a displacement of approximately 434.9 metric tons with a full load. It will have a range of 1200nm at 8kts (14.8km/h) and a crew of 13. They will be capable of transporting two M1A1 tanks or 350 combat troops, or 154.2 metric tons.” The 1700 will replace the LCU 1610 with the first vessel is to be delivered in 2020. Under the contract up to 31 craft can be built through 2027. The Indian Navy has also introduced a new class of LCU, the Mk IV LCU class which succeed the current Mk III LCUs. Designed and built by Garden Reach Ship Builders (GRSE) under a $340 million contract awarded in 2011, the first of eight vessels were commissioned in the Spring of 2017. Constructed for sea movement they can transport vehicles including MBTs or up to 260 troops up to a distance of 1500nm at 15kts (27.8km/h). The Mk IV is well armed including two 30mm CRN-91 guns with Bharat Electronics EON-51 electro-optic directors, two heavy machine guns, four medium machine guns, plus an Russian Igla air-defence missile system. The vessels support the security presence in the Andaman and Nicobar Islands in the Bay of Bengal, and Lakshadweep Islands in the Arabian Sea. The Russian Navy with its major waterways and seas, particularly the Baltic and Black Seas, continues to operate a sizeable landing fleet. These include the Dyugon-class landing craft which can carry up to 140 metric tons of cargo, 3 MBTs or 5 BTR personnel carriers and up to 50-100 marines. Its top speed of 35kts (65km/h) is made possible by its air cavity hull design powered by two 9000hp М507А-2D diesel engines and high efficiency water jets. The Serna class is a smaller landing craft that also uses the air cavity system. They carry one MBT or two BTR wheeled fighting vehicles. Twenty craft are operational in the Caspian Sea flotillas. The Peoples Liberation Army Navy (PLAN) has also sought to field its own landing craft with higher speeds. Its Type 074A Landing Ship uses a catamaran hull that offers a top speed of 18kts (33.34km/h). It has a 200,000kg capacity that can include 2-3 MBTs plus 70 equipped troops. Its 1000nm range and 15 day endurance make it well suited to coastal and offshore operations. It complements the earlier Type 74 with a traditional hull that can carry 100,000kg. 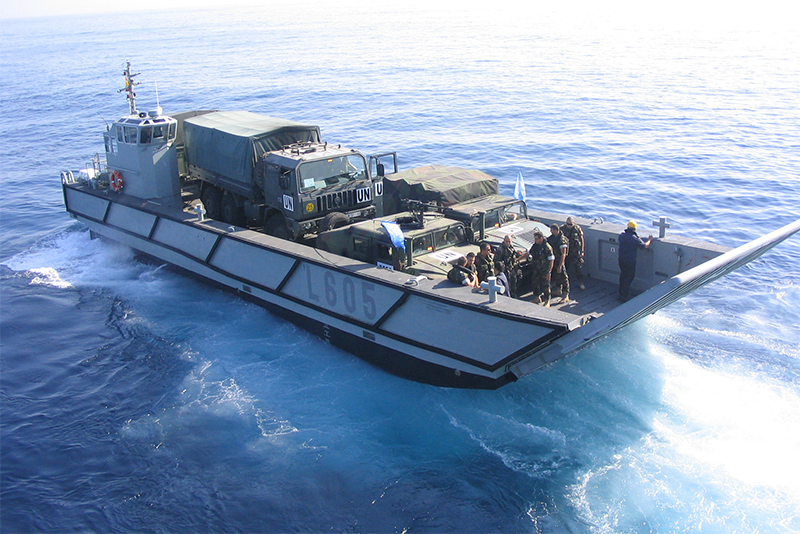 The French Navy has also determined to focus on high speed transit in this case with a unique catamaran hull landing craft, the L-CAT by CNIM. It can reach up to 30kts (55.6km/h) when empty and 18kts (33.4 km/h) when loaded to maximum payload of 72,575 kg. With forward and aft ramps is can quickly load and disembark up to 40 troops and vehicles including an MBT. 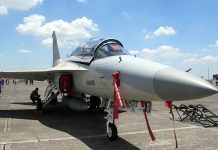 CNIM indicated that it is planning a larger L-CAT based version with greater endurance that can carry two MBTs. The current L-CAT is in service with the French and Egyptian Navies. Landing assets with higher speeds means that amphibious ships can remain further offshore without increasing the transit time to the beach. The application of air cushion craft designs to the landing craft role as in the Textron LCAC (Landing Craft Air Cushion) allows 40kts+ (74km/h) fully loaded. The first LCACs were fielded in 1986 with 91 produced. They can carry 54 metric tons normally and up to 68 metric tons in an ‘overload’ condition. The latter provides the ability to transport the latest M1 MBT. The latest Service Life Extension Programme (SLEP) incorporates four Vericor Power Systems ETF-40B gas turbines; two for lift and two for propulsion. LCACs typically are transported to a landing area and operate from the well deck of amphibious ships. Currently, both the US Navy and Japanese Maritime Self Defence Force use the LCAC which the later began acquiring in the late 1990s. Presently the US Navy’s Ship-to-Shore Connector (SSC) programme is pursuing the replacement for the LCAC. In July 2012, the Navy awarded a $212.7m contact to Textron Marine & Defense for development of the SSC. Scott Allen, vice president Marine Systems at Textron advised AMR that the SSC or LCAC 100 would “particularly incorporate a number of reliability and operating improvements. New technology would offer computer assisted, fly-by-wire, stick & rudder controls to reduce pilot workload. Overall, systems have been simplified with attention to reducing maintenance and increasing reliability.” The first craft will be delivered for Navy testing in the summer of 2018. 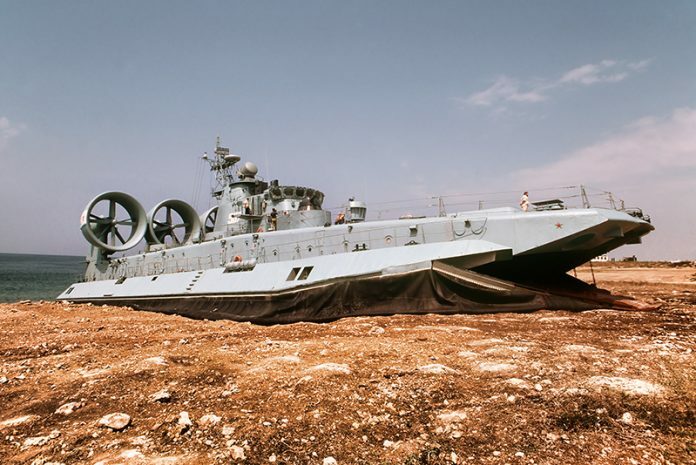 The Soviet Navy began using air cushion landing craft in the mid-1970s with the Aist Class. These have an 80,000kg capacity (up to four light tanks or two MBTs) and speed of 70kts (130km/h). They were followed by the Gus class and Tsaplya class in the 1990s all of which appear to no longer be in Russian service (although the Republic of Korea acquired three Tsaplya craft in 2003). Its current Zubr class is the world’s largest, with a full load displacement of 555 tons and a top speed of 63kts (116.7km/h). It can carry three MBTs (up to 150 tons), or ten combat vehicles plus 140 troops. Zubr is also well armed with Strela-3 man-portable air defence missiles, two 30mm AK-630 close in weapon systems, and two multiple rocket launchers for shore bombardment. Craft are in service with the Russian and Hellenic Navies and the PLAN. With amphibious ships ideally remaining 32km off-shore, the push today is toward landing craft designs with greater speed and higher payloads. The objective is to reduce the round trip time and to place more assets on the beach in less time. That industry innovators have demonstrated this is possible suggests that landing craft will remain a primary means of ship-to-shore movement.